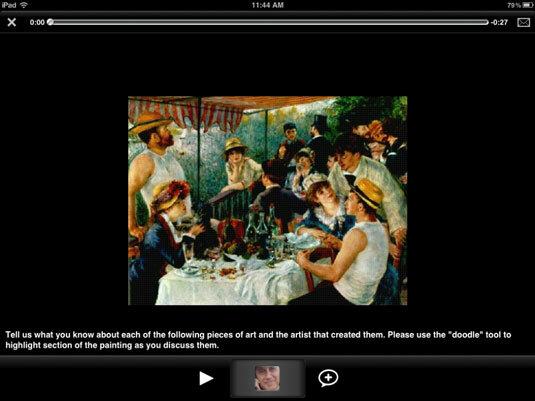 Exchange frontal lectures for two-way conversations with students using VoiceThread iPad app. VoiceThread conversations give students a voice in the iPad classroom learning process, and improves collaboration, participation, and student engagement. You’ve probably used presentations in your classrooms to teach a difficult concept. They can be an effective way to deliver information visually, but one of the drawbacks of presentations is that the information flows in one direction. They tend to become lectures. It’s always ironic to sit in a presentation that calls for more communication and collaboration in education . . . when the presenter spends the entire session giving a frontal lecture. Education thrives in an atmosphere of interaction and dialogue. 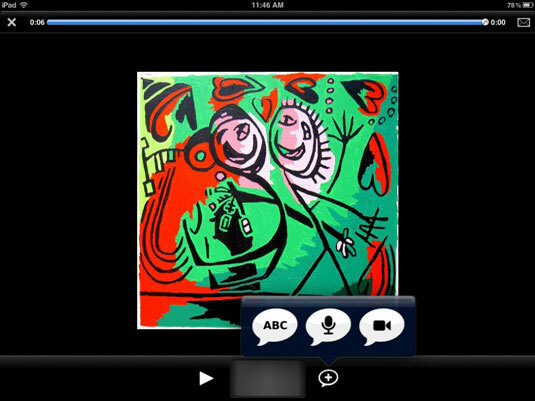 There is also an iPad app that enables you to create and contribute to VoiceThread conversations directly from your iPad. You start your VoiceThread conversation by creating an online slide show comprised of any combination of media, such as images, video, audio, and text. When you’re done with that part, you share your VoiceThread by inviting friends, students, and colleagues to view and comment on it. They leave comments using text, audio, or a webcam. The end result is a vibrant, multimedia conversation that gives everyone a voice even those students who may not normally participate in your regular classroom discussions. Why use VoiceThread for learning in an iPad classroom? Communicating with different media is an important component of a modern education. VoiceThread is a simple method for integrating multimedia into any curriculum. Instead of reading a textbook about learning French, you can have your students use their language skills by creating and narrating a virtual tour through Paris. VoiceThreads give students feedback from an audience. That can be an empowering experience. Sharing options enable you to set the parameters of your audience to a single teacher, classmates or group, the school community, or the public. You also have the option to moderate comments so that they require approval before appearing online. VoiceThreads can be the work of an individual or the product of group collaboration. People can work together and contribute individual slides into a single VoiceThread. VoiceThreads can be a unique way for a student to deliver a portfolio of work in the format of a slide show with narration and reflection upon the objectives and results of each piece of work. Giving meaningful feedback on a VoiceThread is a critical part of the process and an important skill in itself. Allowing students to contribute comments on VoiceThreads develops their ability to critically evaluate the work of others and offer constructive feedback. Explaining a concept in science with images, video and narration. You can also use a doodle tool to highlight parts of an image as you discuss them. Using VoiceThread with K–2 students who may not be ready to write but are perfectly able and willing to tell stories with audio. VoiceThread comments can be left as text, audio, or video. Creating groups that allow conversations with classes in different cities or countries. Learning about basic mathematical concepts such as parabolas or right angles by finding or taking images of real-world examples and explaining them in a VoiceThread. Using webcam commenting to enable conversations between people in sign language. Adding new dimensions to the art of writing a story by having students find or create images that express their story themes and then writing and narrating their stories while displaying the images. Researching and creating a narrated family history that includes photos and video interviews of family members. Distributing visuals to students as a VoiceThread and having students respond with comments. For example, use a series of related photos and have students write a story to explain the images. Find a public-domain clip from a famous movie or create a short video. Strip the sound out, and ask the students to write and narrate a screenplay with dialogue for each character.